Coral Marie is me! It felt like the only appropriate name for a concept that follows my own personal creative journey. Built on on a designer/maker style of working that fosters the value of handcrafted slow fashion. I produce small batch pieces that are made with my own hands, embodying my creative vision and designed for YOU. Sustainability is an elusive goal, that we must pursue. For fashion to become sustainable we should buy less and buy better. It begins with design that is timeless, high quality and produced responsibly. It requires attention to every step of the process from supply chain through the waste stream as well as advocacy and education. 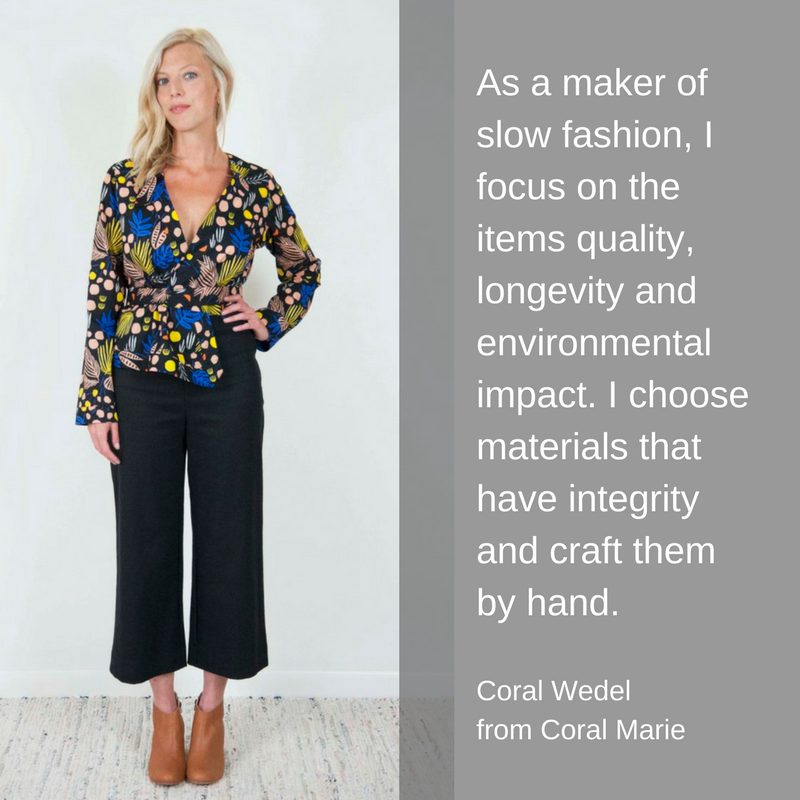 As a maker of slow fashion, I focus on the items quality, longevity and environmental impact. I choose materials that have integrity and craft them by hand. I design pieces with the intention of a long happy life of being worn. What inspired you to start a slow fashion brand? My years of working in the fashion industry for other brands informed my choices as a consumer and ultimately let to an imperative to change my own practice as a maker. Motherhood also greatly shifted my priorities and was the initial catalyst. The only way I could rationally continue in my own field was to do so ethically. So began my journey into creating a space to keep my impact low while pursing my practice as a designer and maker. I believe, that the clothing we wear is of utmost importance because it affects the way we feel and there is such power in feeling. How we feel is a force that can change everything. In this way, what we wear can be an intentional choice to change the world. My mission is to balance aesthetics and function in order to create strong design and to then craft it responsibly. Additionally, developing meaningful relationships and supporting community through my work are an important baseline for what I do. My customers are fabulously vibrant conscious consumers of all walks of life, ages and body types. I have a lot of gratitude for those who support my work allowing my practice to be a reality. Just how terribly important it is. We really can change the world with what we wear! Balance. I find myself in a constant juggling act to balance healthy living, business success and sustainability. Just keeping pace with all that is at hand and all that I want to accomplish while remaining mindful of my limits. As a Mother, I put my family in high regard and already have a lot on my plate. Keeping a disciplined schedule is hard, but essential for keeping all the balls in the air. My Mom because she has always been my most steady support. Her ability to stay strong, tender, determined and practical are most inspiring. Through adversity, she has always appeared to stay positive and grounded. I am forever grateful for her shining example of how to be an exceptional human & Mother.